I still smile every time I come out of the Brixton Tube station and turn left, and it’s like being in Africa and Asia and the Caribbean all at once. The incense man outside the supermarket is really from Barbados, though he pronounces “incense” like a Jamaican. A car passes, blasting the latest funky house summer scorcher, the unholiest of combinations of high life’s easy groove, dancehall’s driving bass, and soca’s call to wine. Piece I wrote for Caribbean Beat Magazineon my ongoing love affair with Babylondon. Ogun and the Jouvay Warriors. Doing research for a piece I’m writing about African retentions in Trinidad Carnival, I came across this. Ologun(“Ogun bearer”)…. Every conceivable professional group in Ondo, except for the civil service and white-collar workers, participates in the celebration. 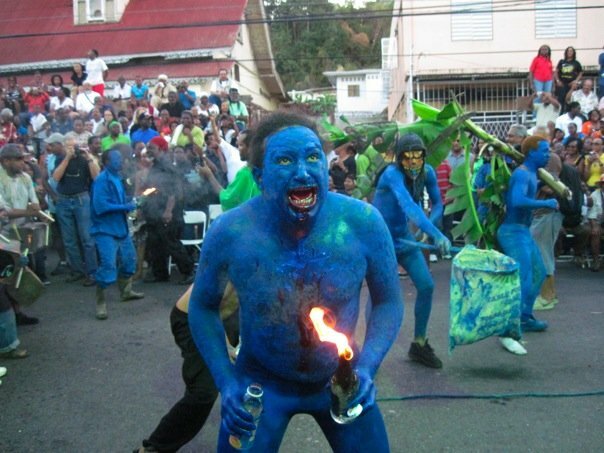 Most are dressed in rags and parade through the town with their bodies smeared with blue, white, and black paint. They sing in praise of the deity and of their procession. The festival is an occasion to celebrate Ogun’s deeds and to display human workmanship. The ceremony becomes an opportunity for a show of force by the individual medicine-Ologun and often creates a temptation for them to test their medicinal power in public and to confirm their superiority. This aptly illustrates Ogun’s attributes as “the embodiment of challenge, the Promethean instinct in man, constantly at the service of society for its full self-realization. We’ve been hinting at the links between Africa and Trinidad Carnival for a long time, but in the spirit of denial and prettification we’ve chosen to erase rather than celebrate what are some glaring and wonderful similarities between our Carnival and the masking rituals of West Africa, specifically the Yoruba. And I get vex every time I hear the same recycled story about Carnival being a French thing that the Africans then used to imitate their masters. It never go so and it’s about time we start to explode those myths. The truth is that the jouvay that got included in the two day Carnival celebration was initially an Emancipation celebration celebrated on August 1st. The procession started at midnight, was a mixture of solemnity, ritual, celebration and defiance. It makes sense that the Canboulay was always a source of confrontation between the jamettes and the colonial authorities. And it makes sense that we should even as we confront the colossal stupidity and ongoing assness of this government, previous governments and I guess future governments, find new ways to use this still existing ritual to do the same confrontation with the authorities that needs to happen. In light of all that is going on politically and socially in Trinidad right now, I am inclined to ask, for Jouvay 2013 what would Ogun do? No self respecting Caribbean person holds allegiance to any other spirit. It’s the first thing you learn to drink. After all it is in your blood. Rum flows in the veins like rebellion. It is strong and bitter like cane burnt in anger. It is what is left after the sweetness is taken out. Before you take a sip. Before you burn the tip of your tongue and feel your whole inside go golden from the heat of liquor coursing through you. Before the feeling goes to your head and your tongue gets loose and your waist begins a barely perceptible oscillation. Open the bottle of rum and pour a libation. Spill three drops on the ground. You do this for those who are not here to part take of the drink themselves. For those who have gone before. For ancestors whose names we don’t remember. For Gods whose names we were forced to forget. For blood spilt and lives lost to make someone else rich. Rum is the drink of forgetfulness for some. I believe that it started as a drink of remembrance.